Tomas Byrne's Skin in the Game is a political thriller that follows two protangoists as they investigate the link between a finance firm and a terrorist organization. The plot is set into motion when the brother of the protagonist, Professor Joe Hawkins, disappears. The deeper Hawkins looks into the situation, the more convoluted it seems, and eventually Hawkins finds himself in a sticky web of money laundering, terrorism, and conspiracy. The other protagonist is Dr. Kate Farrow, a psychiatrist tasked with getting information from an amnestic terrorism suspect. To complicate matters, she must obey her superiors, although she often disagrees with their methods. The various subplots of Skin in the Game ultimately weave together to form a riveting story that'll delight anyone who likes an intellectual thriller. One of the things I like about Byrne's writing is that he adeptly uses perspective changes to progress the plot. I've read a number of thrillers where the author seems so bent on giving the reader a ton of different perspectives that he/she ends up getting the pace of the plot off-step -- not the case with Skin in the Game. The plot does get fairly complex as the novel continues, but the amount of details were manageable. Byrne spends a fair amount of time developing the characters, my favorite being Kate. She's in an interesting situation because, although she is clearly more intelligent than her superiors, she's bound by the nature of the hierarchy. 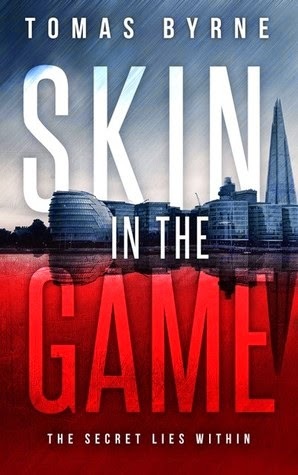 Overall, I'd recommend Skin in the Game to anyone who wants to read a political thriller with a complex plot and a financial theme.